Running a marathon, as a kind of life goal, is an ambition that most people can understand. That’s not to say that everyone will have that ambition, or complete it, but with half a million or so people completing a marathon each year in the US alone, the marathon distance has become a relatively achievable goal. Not easy, as anyone who has actually completed a marathon will tell you, but achievable. Having run a few ultras over the past few years – at 50km, 60km, 70km, 80km and 100km distances – it seemed that this was the year to step up and try and earn my own buckle. You see most milers, carry on a tradition that started with 100 mile horse races in the US, and award all who complete the 100 mile distance with a belt buckle. And while I rarely wear a belt, and am hardly likely to wear a US-style cowboy belt buckle, earning a miler buckle was on the bucket list for sure. 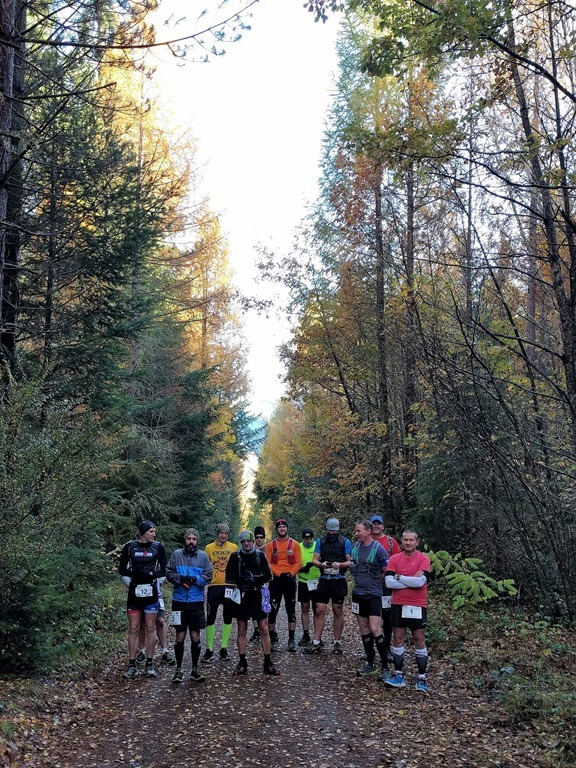 And so news that Heath Lunn, who organizes the St James series of multisport events, was planning a new event, around the Hanmer Forest and with a 100 mile option, piqued my interest. Only about 40 minutes drive from home, it was a chance to do an ultra with the whole family along. The allure of the beautiful Hanmer Springs forests was also a compelling proposition. And so race day dawned. I’d had the misfortune to catch a bit of man-flu in the days before the event and so was worried about what my sore throat and runny nose might turn into after 100 miles. But outside of the health, my training had gone well – I wanted to teach myself how to run longer distances at slower speeds and also to get used to running at night. So in the few months before the event I did a few middle-of-the-night marathons – plodding along in all sorts of weather to get used to slow and steady running. The start line. A dozen or so brave (or stupid) souls await their fate. The forecast for race day was mixed – we expected 12 hours of settled weather followed by a southerly change with gale-force winds and potentially 1-3cms of snow overnight. The fact that racers would pass the start/finish line every 5kms meant that pretty much every piece of warm or waterproof gear was packed in my race bag – all set for every eventuality. Without any ado, at the strike of 10am we headed off. Robert Loveridge – a well known Ironman and runner who I’ve raced with (well, raced far behind anyway) – went to the front and set off at a furious pace. 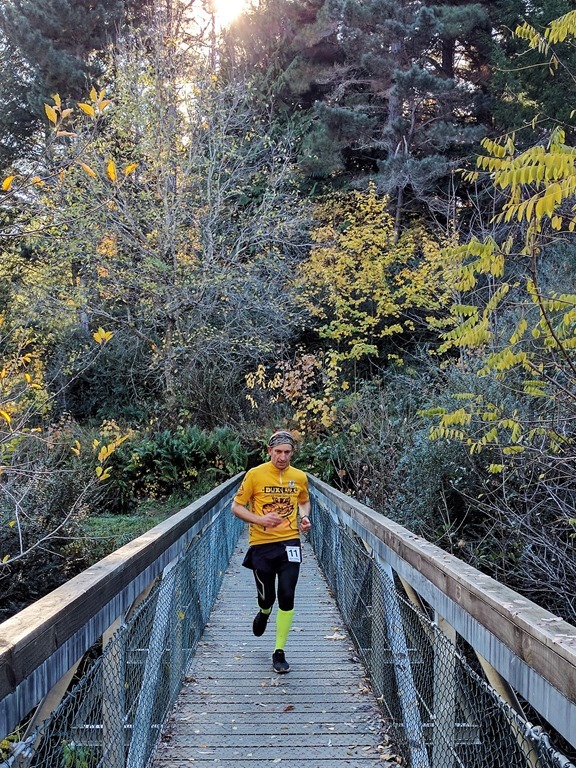 I’d expected him to win and that I’d not see him until the first time he lapped me – one of the downsides of a 10km lapped race is that faster runners pass by as they lap you on a depressingly frequent basis. I was adamant that I wouldn’t make the mistake I’d made at previous races and go out too fast, only to blow up when things got hard – this race was all about slow and steady. So for the first 10kms I plodded along slowly near the back, enjoying the company of some fine gents (there were, alas, only blokes racing the miler). Buddy Tony, a stalwart of the trail running community, stopped to take a photo and I carried on at my steady, but measured pace. I was lucky that eldest son Yonni was playing truant support team for the race and did a great job of meeting my nutrition needs, giving me race updates and, most importantly, hijacking my social media accounts to keep the entire world appraised of my race progress. Every 10km, about 50metres before the lap finish line, Yonni would be waiting to ask me what I needed from him. He’d then run quickly to the aid station that we’d set up, gather my stuff together and give it to me once I got there. He would then, in true OCD form, studiously write down my lap times on his note pad before updating the world on my progress via Twitter, Facebook and Instagram. The bridge crossing just before the lap finish line. This was early on in the race, while the weather was still nice and temperatures were moderate. As I passed other runners out on the course, there were always the cheery “you’re doing really well, keep it up” comments, after which talk turned quickly to when the weather change would roll in. The best guess was that we’d hit darkness (about 5:30pm) in fine weather, but a few hours later the inevitable would happen and things would get grim. Given that most of us were expecting to run through the night, and into the day beyond in many cases, this was a worrying thought. Running a marathon in inclement weather is generally OK since you’re running fast enough to generate body heat and hence not get cold. Ultra marathons are a different kettle of fish and often see people walking significant portions of the race. Walking doesn’t really generate enough heat to keep you warm and later on we’d see people in a pretty sorry state because of the cold. I ran my first 100km in about 11 1/2 hours. Given that I’d only run 100km once before, and that had taken me over 14 1/2 hours, I was relatively happy. But, as is often the case, little doubts sat at the back of my mind as to whether I’d gone out too fast. I’d heard many a story from experiences miler-vets about how, at the 120kms mark, the wheels often fall off and things go sideways. The last thing I wanted was to be out all night unable to run and having to resort to a death march for hours upon hours. As for my place in the field – I figured I was somewhere around fifth – but wasn’t too sure. One thing I was kind of looking forward to was what I’d also heard form many endurance athletes who reported strange visions and hallucinations as day turned to night and the accumulated impacts of 12+ hours on the go started to hit. Some people even report of seeing apparitions of running partners who accompany them on their way. It seemed like an opportunity to achieve drug-like outcomes without taking any drugs – alas I didn’t see any visions or gain any imaginary friends. It was just me, the trees and the toadstools (oh and the handful of possums that I saw on the way). Even though it was dark seven or so hours in, there were still things to see – until the southerly hit we had an incredible sky with an amazing star show for us all to enjoy. Since Yonni had to get up early in the morning to race his own event, the 50km distance, wife Viv and youngest son Omri turned up to take over crewing duties. Yonni retired to a sleeping bag at the back of the car and just as the southerly hit with its wintry rain and sleet (and the odd bit of snow) Viv got to take over sitting under a gazebo trying to stay warm. Viv has never actually been at one of my ultras before and it was pretty special to have the whole family there helping me out – I was under no misconceptions that I would be able to walk after the event – so having someone there to help me get into dry clothes and pack up all my gear was totally invaluable. The weather change, while it did certainly cool things down, wasn’t a huge problem. 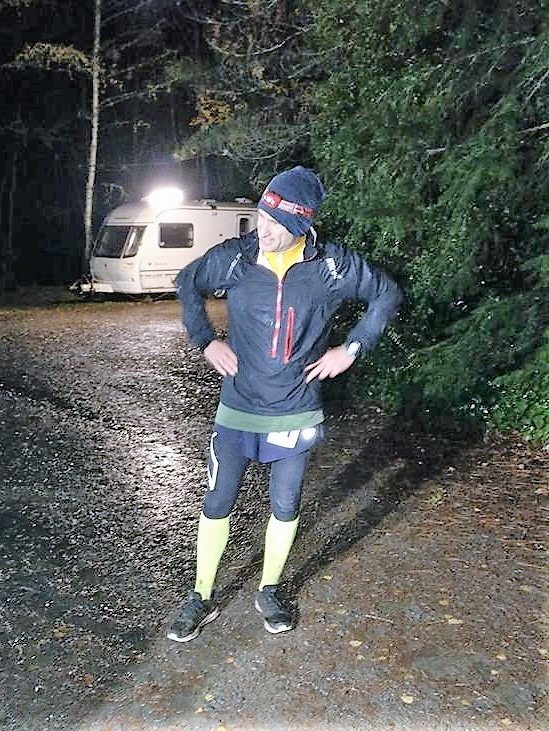 I was still running pretty freely and hence only had short patches of walking the steep climbs – I was thus able to stay warm and didn’t wear any more than a thermal base layer, an old cycling jersey and a thin rain jacket all night. I quite like running in the rain, while it did make the track much more slippery, and caused a fair amount of mud to be churned up, it’s quite refreshing hearing the pitter-patter of raindrops on the hood of your jacket. It’s also pretty special seeing the individual droplets of rain sparkle in the beam of your headlamp – like millions of stars. Just before Yonni handed over duties to Viv, he told me that I’d been running consistently in third place for much of the race but that I was catching the second placed racer, Glenn Kelly. Yonni’s intel about him looking sore and using walking poles gave me a bit of motivation to up the tempo slightly in the idea that I’d run with him for a few laps – for company as much as anything else. Sure enough, 15kms or so later I saw the reflection of a pair of gold coloured walking poles. I ended up running with Glenn for 15kms or so. Interestingly I found the lap and a half I ran with another racer really hard – running is a pretty individual pursuit for me and I think I perform best when I just go at my own pace and focus inside my own head. While it was awesome to run with him for a little while, at the 140km mark I was kind of pleased when Glenn pulled off at the aid station to change into some dry clothes. I fully expected to slow down as the run got more painful, but I just wanted to see how I went. With one lap to go I wanted to make sure my lap count was correct and yelled out to Heath that I was starting my last lap. His response was that I was in first place. I scratched my head and kept going. I’d not seen Robert, the person everyone expected to win, since he’d run off the front at the start. While I’d passed a few people in the last few laps, I’d just assumed they were slower racers who I was lapping. With 5kms to go I shouted out to Viv that I would be finishing in about half an hour. Yonni, the eternally loyal fellow-racer that he is, had wanted to be woken up to see me finish. The last downhill was sweet, I was stoked to think that, after 16 times running past the same trees, this was my last passage. Coming into the finishing line was awesome. I’d not really known what time to expect – I figured sub 24 hour would be fine and anything sub 20 hours was a great result. As it turned out I did it in 18:21 – a time I couldn’t be happier with. “What? What do you mean I won? I can’t have!” Confused, tired and happy just after finishing. It took a few minutes before I understood what Heath was saying to me and that I’d actually won the event. Unbeknownst to me, Robert had gotten cold in the rain, and slowed down considerably – it seemed that the guy I passed a couple of laps before who grumpily asked me how many laps I’d done was he. Suffering his own private turmoil. All in all an awesome race. My first miler, a time I’m ecstatic with, and the outright win to boot. A quick hour sleep in the car and it was up to watch Yonni race his 50km ultra. But I’ll leave it to him to recount that story. Big thanks to Heath for organising, and all the other racers who were out there as well. And thanks to Viv, Yonni and Omri who were an awesome crew to have helping me. It’s a committed and loyal wife who braves the wind and rain at 5am and helps you strip off wet, muddy and smelly clothes to change into something dry. Post script – Sometime the best (read: funniest) things about an event happen afterwards. Yonni shot this video as we got home from the race. While I ran pretty well for 160kms, I didn’t walk too well afterwards!